Here's the latest AOO news! Iota Men participated in the 2017 Divine 9 Legislative Day at the NC Legislative Building in Raleigh, NC on May 18, 2017. Pictured from AOO are NC State Director Clayton, Polaris Wilson, Vice-Polaris Durham, Secretary Smith, and Bro. Wesley. Bro. Bienvenu from Iota Omega Chapter (Charlotte, NC) is also pictured. Iota Man Gives His Trial Sermon! Congratulations to AOO Brother Vincent Williams who gave his trial sermon at Hood Memorial Church on May 7, 2017! On April 22, 2017, AOO Iotas partnered with local Boy Scouts of America Troop 29 to raise funds via a Car Wash. The event was a success and both groups enjoyed collaborating to raise funds for future projects. Welcome the Newest Members of Iota Phi Theta®️, AOO Chapter! Welcome to the Brothers of I.S. Insurgents, the newest brothers of Iota Phi Theta ® Fraternity, Incorporated, Alpha Omicron Omega Chapter. Brothers Leo Wesley (Line Name: Pastor Troy, on right) and Shaun Mance (Line Name: Re-run, on left) became Iota Men on March 25, 2017. Thank you Bro. Ruel Samuels (Director of Membership Intake) and Bros. Joseph Lee and Paul Torrez (Asst. Directors of Membership Intake) for your leadership and guidance in helping these good brothers become Iota Men. Congratulations to AOO Chapter Brother Command Sgt. Maj. Garton E. Francis, who took over the position of Brigade Command Sergeant Major of the 25th Sustainment Brigade, 25th Infantry Division (Wahiawa, Hawaii) on February 10, 2017. AOO Brother Recognized for Work in Community! Throughout the 2015-2016 school years, Brother Melvin Nelson (top right corner of photo) was one of 10 mentors with the Men Of Promise (MOP) Mentoring Group at Westarea Elementary School. One of the activities conducted by Bro. Nelson included a recreational session with eight youth males at B & B Bowling Lanes. He and other mentors discussed bowling techniques and other health initiatives with the boys while bowling three games and lunch. Bro. Nelson participated in the majority of the sessions throughout the year and was the lead mentor for a few sessions especially the school’s safety of African American Youth Session resulting in him being named MOP Mentor of The Year. Congratulations Bro. Nelson! 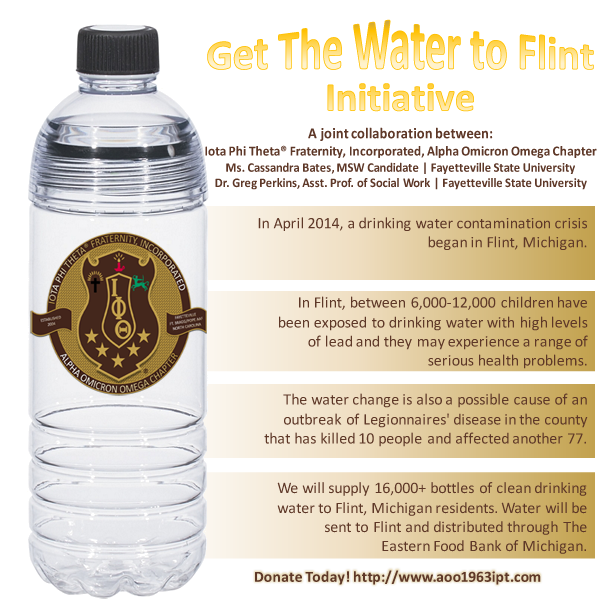 Click the "GTWTF" link on the left menu bar for more information/donate! Brothers from AOO, Xi, and brothers from other NC chapters celebrated the life and legacy of Dr. King along with the Fayetteville NPHC and other members of the Fayetteville/Ft. Bragg community on Saturday, January 16, 2016 during the Annual Fayetteville MLK Parade. Iota was well represented. Look for photos from the parade in our 2016 photo album!